It is the end of July 2004, wonderful weather. 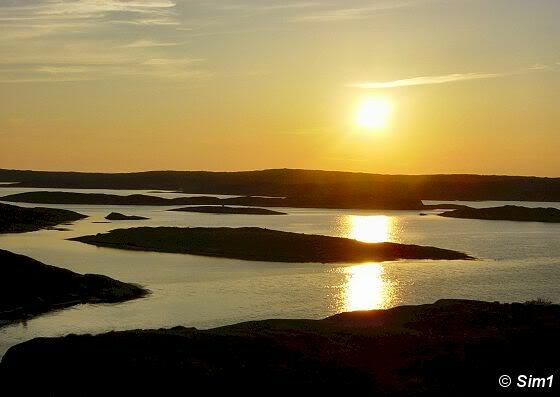 I had heard lots about Stocken and about the island of Orust, I've seen photos; beautiful ones. But when I crossed the bridge and was on Orust, I was amazed. This place is so beautiful! We entered Orust from the north and quite quickly after you've entered the island you will come to this view point. I didn't need much time, I knew it right away, this is my kind of place! And since this very first visit, I have been back to this part of Sweden many times, and enjoy it equally as much on each visit. I doubt that many of you have ever heard of Orust before, let alone about Stocken. So let me start this page with telling you where it is. 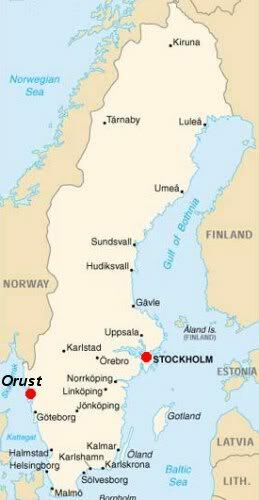 The island of Orust is located south western part of Sweden, just above the city of Göteborg. 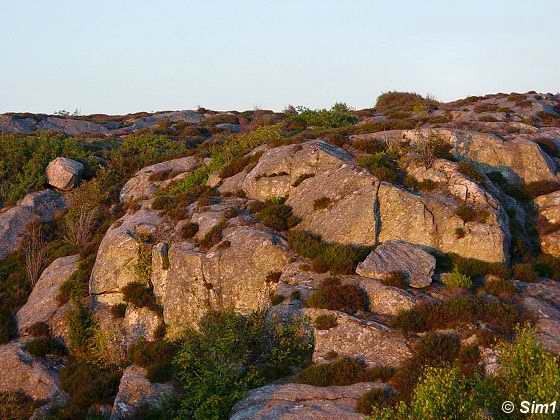 It is located in the region of Västra Götelands Län. 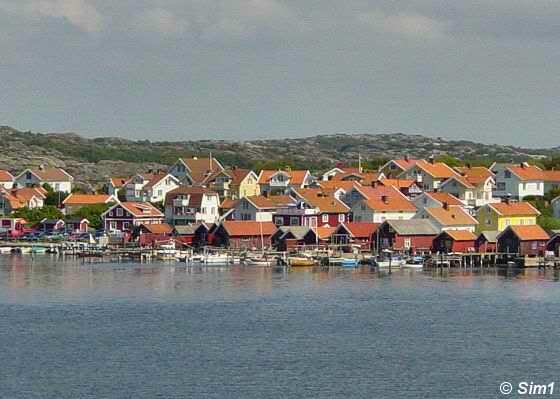 The place I had as my 'home base' was the little village of Stocken. 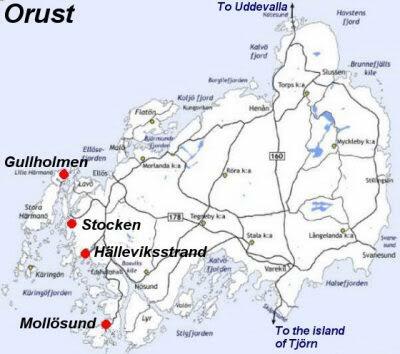 Stocken is located on the west side of the island. From here I visited several other places, mainly all of them located on the west side of the island. Why? Well, hahaha, that might actually be hard to explain ;-) But maybe I can show you a little bit why on this page. Stocken is only a small village, not much to do here, not much to see. But the place has a certain charm and the surrounding area is so beautiful and tranquil. I just loved it here. Please tell me.... how can I not love this place? Zooming in with my camera on the village of Stocken. 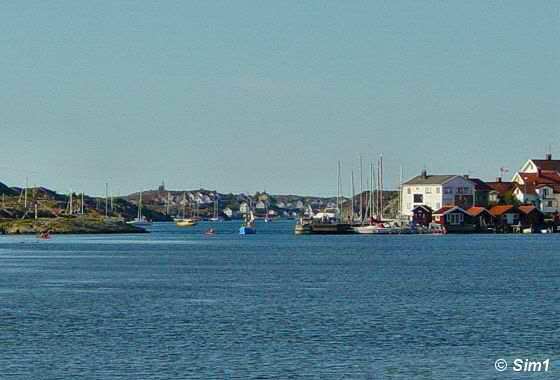 Of course there are many little boats, as this area is the place to be if you love being on the water. 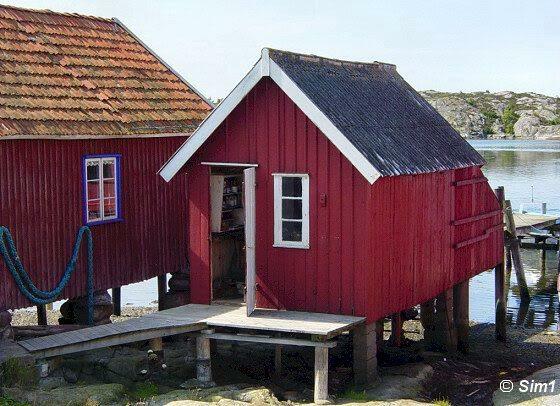 You can see the picturesque red boathouses on the waters edge and behind it the houses of Stocken itself. 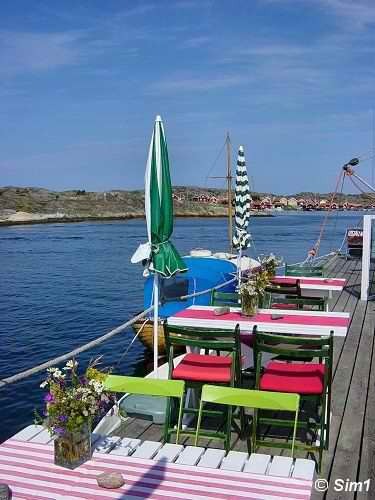 After your walk go back to the main street where you will find this perfect spot to have a drink and relax. 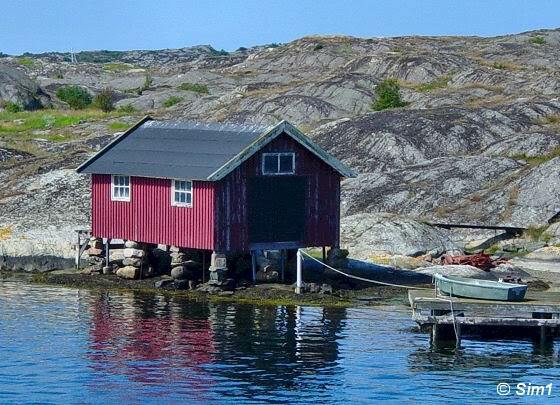 In the picture you can see one of the many boat houses or sheds. 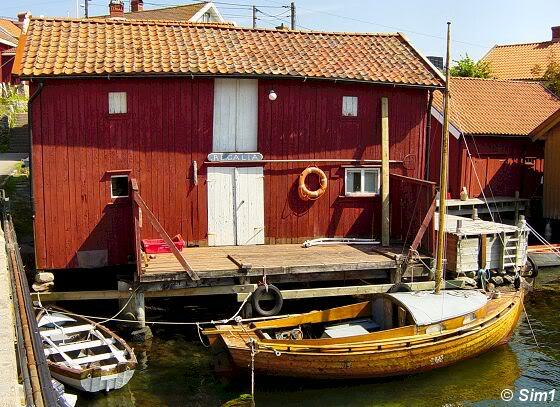 They looks so picturesque on the waterside, several in a row, all painted in red. All of them have a little pier on the backside as the main reason to build them was as a storage place for the fishing boats. But these days are over, many of them now have been changed into little summerhouses. Only a few of them are in their original state. But bring your wallet if you want one of these! They don't come cheap. 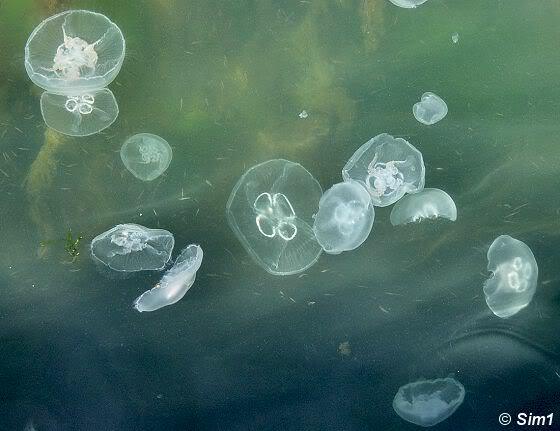 I guess everyone would like to live on the waterside for little while, especially on one of these wonderful sunny summer days. 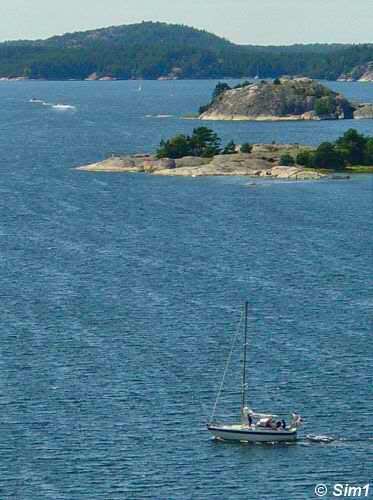 Another view across the water; this is the island of Råön. 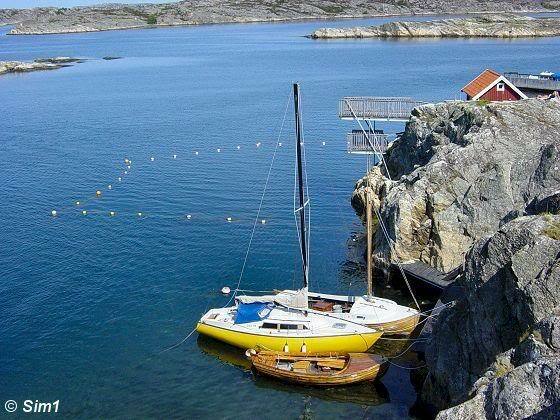 This island is only accessible by boat, and as I haven't got one, hahaha, I haven't been here. The view from Stocken to the island is lovely though. The bare cliffs, and than all of a sudden this group of colourful houses. Mainly in red and yellow, making it look so cheerful. A great thing to do is climb up the hill in Stocken. Finding your way might be a bit strange though. It is hard to see what are streets and what are gardens. All the houses are build quite close together as there isn't so much space on the hill. But it is fun to find your way up to the top, taking numerous little stairs and alleyways. And on top you are rewarded with this wonderful view. If you feel like it you can take a dip in the water here as well. Behind the boats is a little swimming area which looks like a great place to go for a swim. And at the rocks there are two high platforms where you can dive from. I prefer to sit on the rocks and enjoy the beautiful views and let the more courageous people go for a swim here. To my surprise there are actually lots of people that do go swimming here. Well, this will probably not be the highlight of your visit to Stocken and surrounding area, but it was fun to see for me. I have something with mailboxes and I always take a picture of fun ones and different ones. 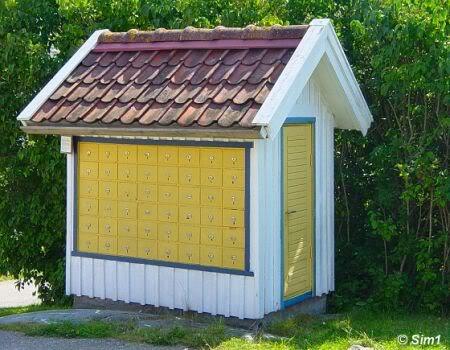 And this is not one of the usual ones, so here we have it: one picture of a little mailbox house. Go to the west coast and eat fish! The west coast means fish! You can't travel here without trying some of it! 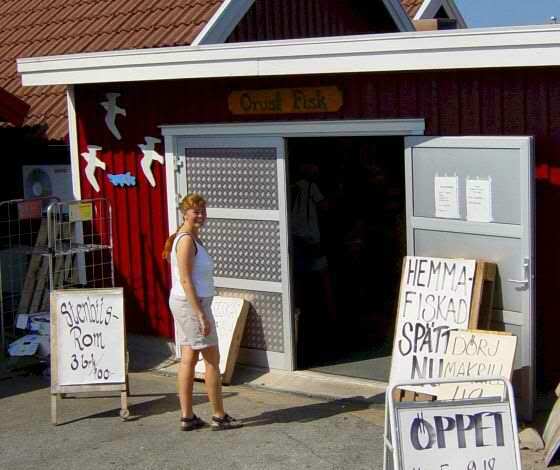 And Stocken has a really nice fish store called 'Orust Fisk', with lots of choices of fabulous fresh fish. The store is located on the main street, and when you can't find it, just ask someone. I am sure they can point you to the right direction. But what to buy? So much to choose from, and so little time to try it all! 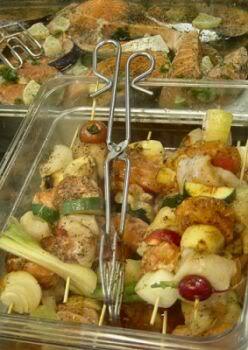 Of course you have to try some salmon, you can buy already marinated and that tastes really good! But of course you can buy plain also, or smoked, mmmm, everything tastes great! 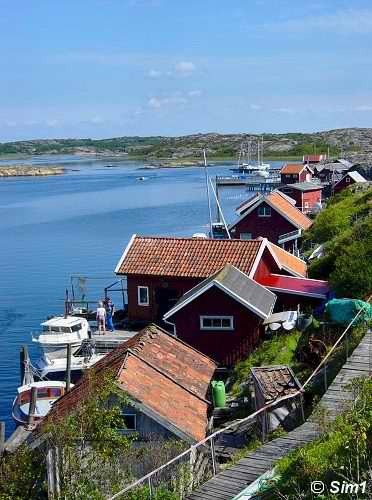 You can't travel to the west coast of Sweden and not try out some shrimps, oooh and crayfish! The Swedes love crayfish! Sill (pickled herring) for when you have a little party. Time to return to the campground, which is located next to the village of Stocken. 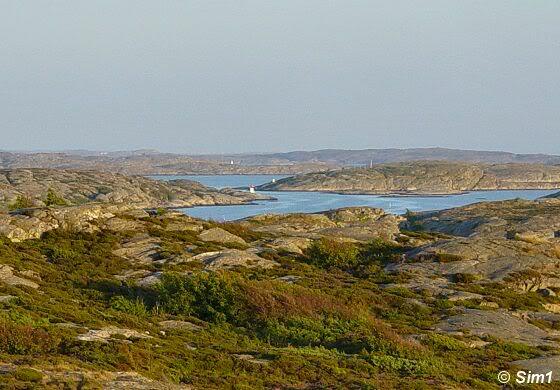 From here you can make a 5 minutes walk to a little bathing area called Badviken. It is a nice path with rocks on either side of the trail. 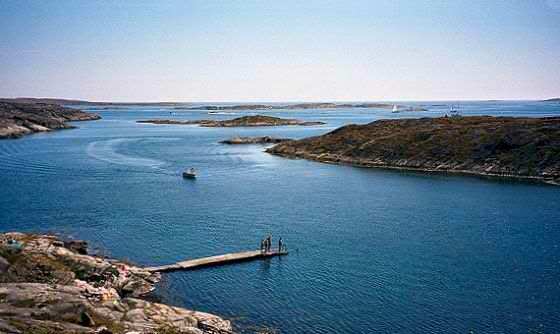 You know by now that I am not so much into bathing in these Swedish waters, but wowww, look at the view!! Isn't it stunning?!!! This photo is taken just left of the bathing area. I just love these bare rocky shores of the west coast. There is hardly any vegetation on the rocks, it is mostly bare rocks with some plants scattered around. And the sea is full of little island, or maybe better said, huge rocks sticking up from the sea bottom. 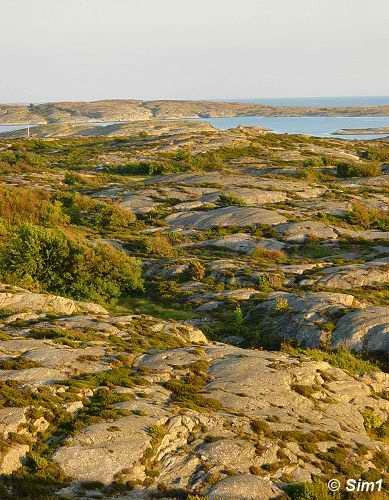 I think the best tip for Stocken, and for the whole area actually, is to just climb up those rocks! I know that most of the time there are no clear trails that lead up the rocks, so maybe it doesn't look so inviting. But as the rocks are quite bare, climbing up them is not so hard to do. Make sure you are wearing some good shoes, so you won't slip off the rocks, and try to find your way to the top. 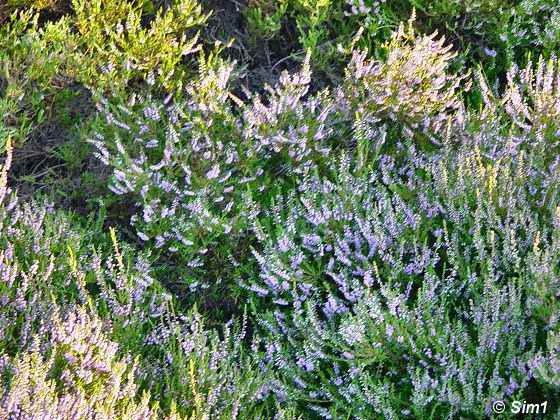 From up there you have the most wonderful views over the sea and the surrounding landscape. I hope my photo can tell you more than my words can. It is so hard to describe the feeling to be here. But I'll give it a try. Turn your head to the right. Now you are looking straight at the sea. The orange colours on the rocks have intensified. Small islands in the sea, calm waters... this place is so relaxing. After a nice and quiet walk back from the rocks to the campground the sun has set. 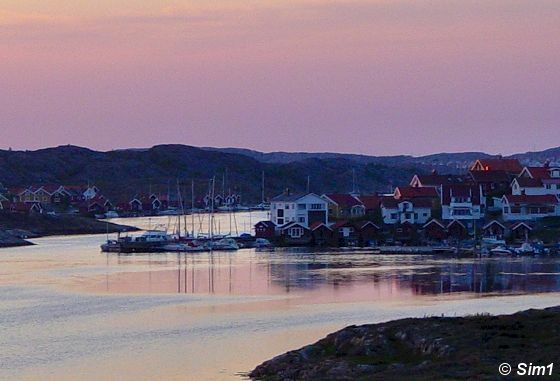 The sky over the village of Stocken is not orange anymore, the sky has now changed in different shades of pink. As a last little tip I would like to say something about the surrounding area of Stocken. 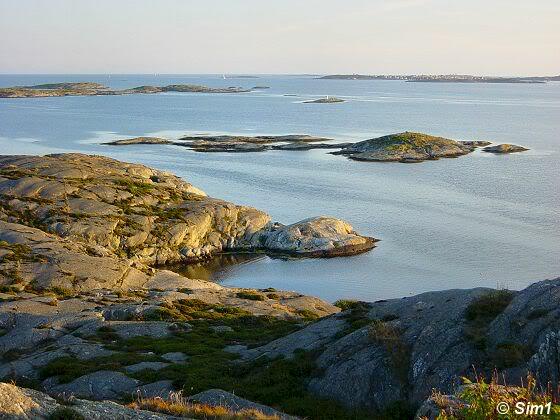 It is not only Stocken that makes this a beautiful area, there is lots more to see and do. 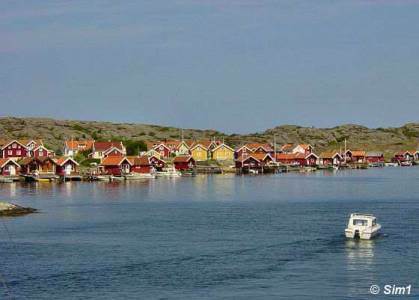 Visit the picturesque villages of Gullholmen, Hällevikstrand or Mollösund for example. Or go for a nice round tour on the bike; do some hiking or go on a sailing trip. 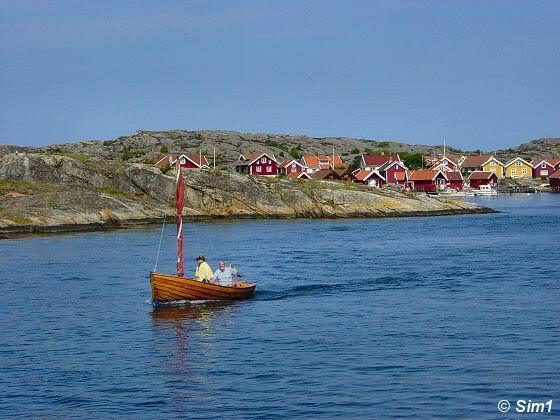 There are several boats that do tours and if you are lucky you might even spot some seals sunbathing on the rocks.